Here ducky, ducky! Quack quack! Alright, so we're not having any luck over here. A family of ducks has decided to invade our parking lot. There was this heavy rain storm and it flooded the low end of the lot. Then these ducks just swooped in and made themselves at home, waddling and splashing away like they owned the place. Not that we mind having the feathered company, but it is right in the middle of the parking lot and they don't seem to want to move for the employees trying to get home. Do you think you could help us out? Maybe go over there and talk some sense into them? What do you mean you don't know duck? Well, fine. Maybe just go scare them off then? Right, that's a bad idea. Last time one of the employees got too close the duck family charged at his feet quacking angrily. Hm. Maybe if you approached them as a duck? You know, like waddle and flap your wings... you don't have wings? Well we can help with that. 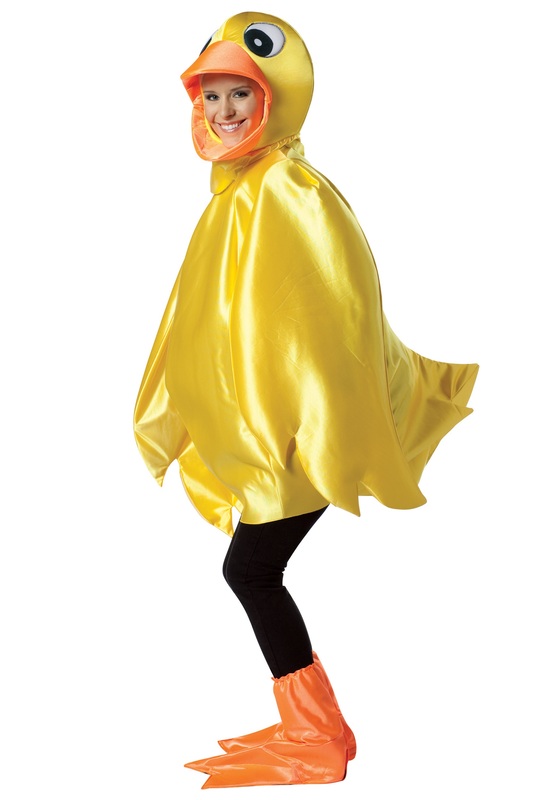 Just put on this Adult Ducky Costume. It has a big yellow duck tunic with orange duck foot covers and a little ducky hood (with orange beak!). There. Now you should be able to approach them without any worry. Wait! What are you doing? You're not supposed to join them! Dang it. Now we want to come splash in the puddle too.